At last the summer species are here. There is nothing like fishing on a warm sunny day and catching lots of different species. That sums up summer for me. I love it when most of the summer species arrive, because you have no idea what the next fish is that you are going to catch. Unfortunately due to a number of reasons I was not able to get out over the weekend and try myself, but I know plenty of mates that did, and some of them had a great time. We seen plenty of hounds landed from all along Chesil, and although we don’t get the numbers or size that they get in the Solent, we don’t have periods where it is unfishable due to weed. 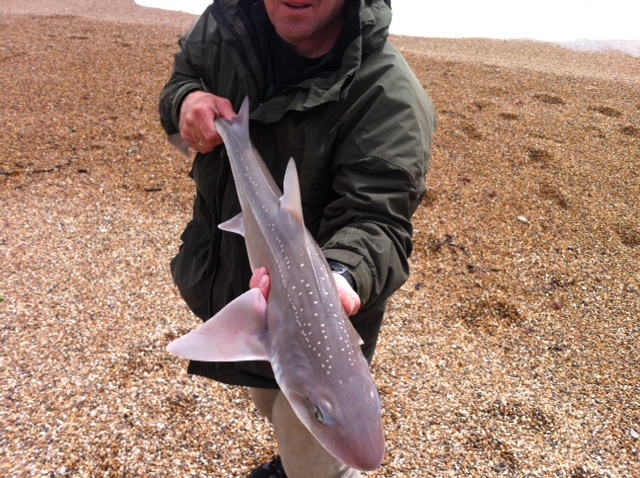 I heard of plenty of Gurnard and a few Bream caught down at the Ferrybridge end of Chesil. Mackerel are also showing in decent numbers at last. All we are missing are the Trigger Fish, but I don’t expect to see them in any number until August. This week I hope to bring you a number of articles that I have been promising for some time, those will include what you need to start salt water fly fishing. Adrian is in the process of writing the first of a series of articles on the basics of lure fishing. You may have noticed that I am having to recycle some of my stock photo’s to use in the posts. I am sure you will agree with me that it is a bit boring seeing the same pictures over and over. To get round this we have decided to create a photo competition, so that we can all get to see your great fishing pictures. There will be a number of prizes up for grabs, so keep checking back this week, or make sure you are subscribed to the site to receive regular notifications. Chesil Beach: Calm and almost clear. Weymouth Bay: a bit of surf running and almost clear water. Chesil Beach forecast: With a North Easterly wind for all of the early and mid part of this week, Chesil will be calm and clear. It will also allow you to hit a bait out a good distance, which should help when targeting the Plaice and Smoothound. The May water has finally broken up, leaving the water almost clear once again. This will ensure that the Mackerel will be much easier to catch, and hopefully they will come in close inshore, so that everyone can get a chance to catch them. The Ferrybridge end of Chesil is producing better then Abbotsbury, with a good selection of Gurnard, Bream, Rays and even a few Bass. One fish that I have noticed being more prolific than normal on the beach, are Wrasse. I had several cracking bites on Friday, whilst fishing for Smoothound, only to find a Wrasse attached to the end. Portland: Talking of Wrasse, we are now into prime Wrasse season. These hard hitting fish will give a good account of themselves on light tackle. Use either float fish Ragworm, or soft plastic lures bumped over the bottom, for the best fight. Pollock should be around at first and last light. Again float fishing or trying with lures will work. Fish the lures higher in the water than for Wrasse. White Sidewinders, or Eddystone Eels work well for Pollock. Portland Harbour: With smaller tides this week, the harbour always seems to quieten down a bit. The Bass move into the deeper water in the harbour, but Flounder and Mullet can still be caught. 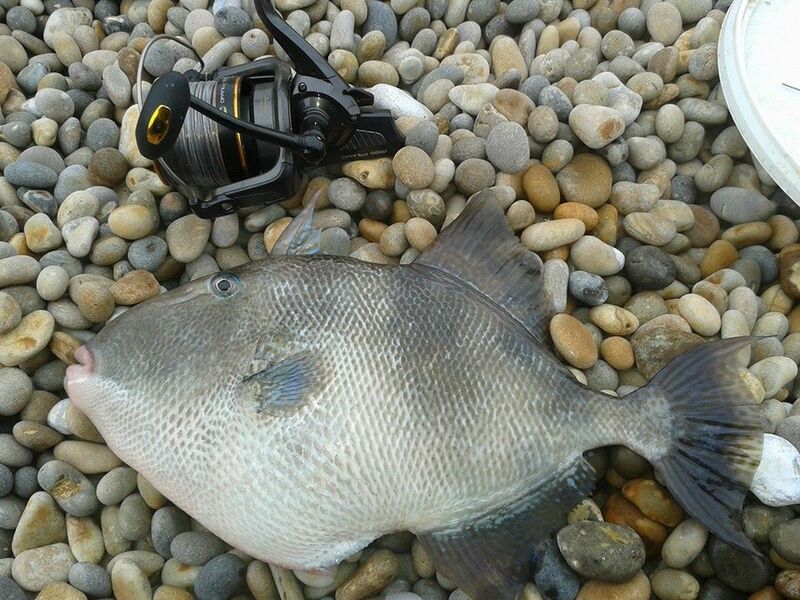 Weymouth Bay: Now the summer species are here, both Preston and the piers will fish well. If you are after lots of different species then the piers are the place to try. It is quite easy to catch a half dozen different species in a couple of hours. The inner harbour is full of Mullet, both thick and thin lipped. Use floating bread crust to try and tempt the Thick Lipped.